In 1971 the Perron family, consisting of mother Carolyn (Lili Taylor), father Roger (Ron Livingston) and daughters Andrea, Nancy, Christine, Cindy and April, move into a dilapidated house in the country. Whilst initially the house is fine, increasing levels of paranormal activity begin to occur, resulting in the family seeking the assistance of famous paranormal researchers Ed and Lorraine Warren (Patrick Wilson, Vera Farmiga). Soon into the investigation, Lorraine declares an exorcism may be required, though this must be approved by the church. With the scale of the paranormal experiences heightening, and Lorraine still fearing elements from previous cases, the Perron family are running out of options. Modern horror films get a lot of stick for all relying on either over-the-top gore, or simple jump scares. Here, it is nice to report, this is not the case. 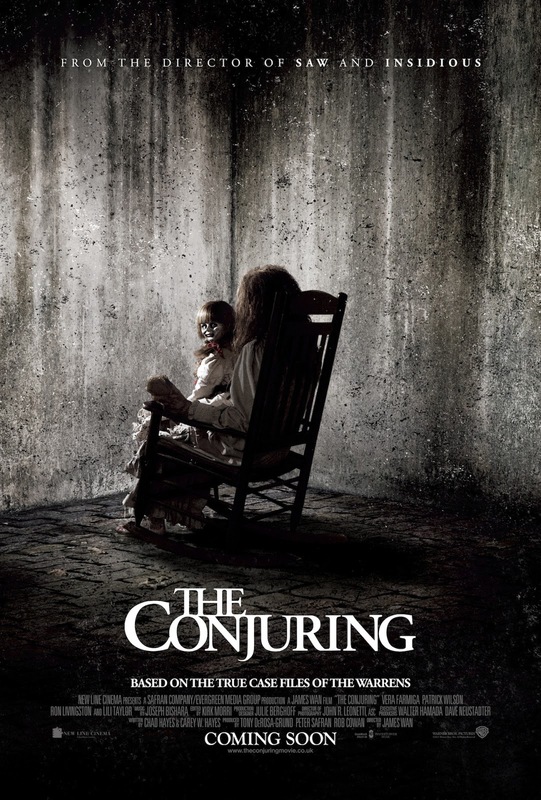 "The Conjuring" is the most old fashioned horror film in a decade. Even from the moment the film's bright yellow logo flashes on screen, elements of films such as The Exorcist (1973) come flooding in. When surrounded by modern slasher films like "You're Next" and recent supernatural horrors such as "Mama", it was highly refreshing to see a horror film that tries to be old fashioned, and a little bit retro. It may not have worked flawlessly, "The Conjuring" could be a hell of a lot scarier, but as a film, it works. The acting in this is phenomenal. In fact I'd go as far to see it's the best acting I've seen in a horror film since 2010's "Let Me In". I've always been fond of Vera Farmiga, and she does not disappoint here. As the clearly troubled, but affectionate mother and paranormal researcher, we really feel the emotion she puts into her research and work, and you have no doubts she just wants the families she works with to be ok. Lili Taylor is also incredible as the mother of the family. Slowly building up from her original calm, friendly self, and suddenly being plunged into a possessed mother role was brilliantly handled, and Taylor performs this masterfully. This just goes to show that horror films can sport good acting, as long as the film has a good script. The story itself is also remarkably fresh and original. The whole "family moving into a haunted house" has been used an unbelievably amount of times, but the story progresses and plot points pop up in a way that hasn't really been done before. The exorcism itself is first mentioned early on in the film, but doesn't properly surface until the final act. This allows us as an audience to build with the film, and support this idea by the time it comes to it. Also, the film begins almost with a double narrative; we're shown the story of the Perron family, and also the Warren's, though they are not yet tied to the same story. When eventually the Perron's do seek out the Warren's, we trust them. Because we've already seen and grown to like them, this makes their introduction into the main narrative far smoother. Again, it's something I've not seen done effectively in a horror film before. But, unfortunately, where the film falls flat is it's actual horror. There are a few brilliant jump scares, one highlight including a brilliantly shot and staged game of hide and seek, but on the whole, this could be a lot scarier. Due to the brilliant cinematography, it is effectively creepy from start to finish, but even when director James Wan pushed the film in its final act, it just isn't enough. It's refreshing to see a film with hardly any CGI these days, and it gave it a brilliantly old fashioned vibe, but against other recent horrors that have had budget on their side, it just doesn't really hold up. The Conjuring is a good film. It has all the making for an exceptional modern horror, it just doesn't have the fear factor to push it that bit further. Wan himself is simultaneously working on the follow-up to the pretty awful Insidious, and maybe it was a bit of an overkill to be directing two horror film's at the same time. Perhaps more of Wan's effort has been put into Insidious: Chapter 2, which could prove to be successful, it just would've been nicer if more effort had been placed here. It starts off well, and it constantly has promise to excel, but "The Conjuring" just doesn't feel complete. To Summarise: Brilliantly acted, smartly plotted and effectively shot, "The Conjuring" is a strong, if only occasionally frightening, old fashioned horror.